Sometimes, especially in Thai language documents, King Mongkut might also refer to Vajiravudh (Rama VI), reigning title Phra Mongkut Klao Chaoyuhua (พระมงกุฏเกล้าเจ้าอยู่หัว). 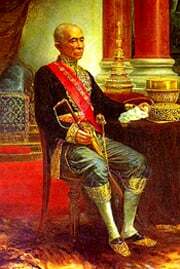 Mongkut (Rama IV of Siam) (October 18, 1804 – October 1, 1868), was king of Siam (Thailand) from 1851 to 1868. Historians have widely regarded him as one of the most remarkable kings of the Chakri Dynasty. After the death of his father, King Rama II, in 1826, Mongkut’s succession to the throne was challenged by his influential half-brother, Nangklao, who was strongly supported by the nobility. Mongkut spent the next twenty-seven years wandering as a Buddhist monk, seeking Western learning and working to establish the Thammayut Nikaya, a reformed order of Buddhist monks that he believed would conform more closely to the orthodoxy of the Theravada school. He was known for his excellent command of English. In 1851 Mongkut ascended the throne and immediately instituted modern innovations, in order to protect Siam’s sovereignty from British and French imperial powers. In 1855 he concluded "the Bowring Treaty" with the British government, opening a new era of international trade in Siam. The Bowring Treaty served as a model for a series of treaties with other Western nations, but came to be regarded as an “unequal treaty” and was later revised. Mongkut is famous as the subject of a book by Anna Leonowens, who instructed his children in English, which later became the inspiration for the musical and movie, The King and I. Prince Mongkut was born October 18, 1804, the son of King Rama II and his first wife Queen Srisuriyendra, whose first son died at birth in 1801. Prince Mongkut was five years old when his father succeeded to the throne in 1809. According to the law of succession, he was the first in line to the throne; but when his father died, his influential half-brother, Nangklao, was strongly supported by the nobility to assume the throne. Prince Mongkut decided to enter the Buddhist priesthood. He traveled in exile to many locations in Thailand. As a monk and Buddhist scholar, King Mongkut worked to establish the Thammayut Nikaya, a reformed order of Buddhist monks that he believed would conform more closely to the orthodoxy of the Theravada school. It was said that the newly-established order was tacitly supported by King Nangklao, despite opposition to it by conservative congregations, including some princes and noblemen. Later, when Mongkut himself became King, he strongly supported his sect, which later became one of the two denominations of Buddhism in Thailand. Prince Mongkut spent the following twenty-seven years seeking for Western knowledge; he studied Latin, English, and astronomy with missionaries and sailors. Prince Mongkut would later be known for his excellent command of English, although it is said that his younger brother, Vice-King Pinklao, could speak even better English. After his twenty-seven years of pilgrimage, King Mongkut succeeded to the throne in 1851. He took the name Phra Chom Klao, although foreigners continued to call him King Mongkut. He was aware that the the British and French imperial powers presented a threat to his country, and instituted a number of innovations, including ordering the nobility to wear shirts while attending his court, to show that Siam was no longer barbaric from a Western point of view. Contrary to the popular belief held by some Westerners, King Mongkut never offered a herd of war elephants to President Abraham Lincoln during the American Civil War for use against the Confederacy. He did offer to send some domesticated elephants to President James Buchanan, to use as beasts of burden and as a means of transportation. The royal letter, which was written even before the Civil War started, took some time to arrive in Washington DC, and by the time it reached its destination, President Buchanan was not in office any longer. In his reply, Lincoln, who had succeeded Buchanan as the U.S. President, respectfully declined to accept King Mongkut's proposal, explaining to the King that American steam engines could be used for the same purposes. During Mongkut’s reign and under his guidance, Siam entered a treaty relationship with Great Britain. Sir John Bowring, Governor of Hong Kong, as representative of England, concluded the trade treaty (later commonly referred to as "the Bowring Treaty") with the Siamese Government in 1855. The Bowring Treaty later served as a model for a series of trade treaties with other Western countries, and historians often give credit to King Mongkut (and Sir John Bowring) for opening the new era of international commerce in Siam. Later, these treaties came to be regarded as “unequal treaties,” and after Siam had been modernized, the Siamese government began negotiations to renounce the Bowring Treaty and other similar treaties during the reign of King Vajiravudh, Rama VI, grandson of King Mongkut, an effort that did not succeed until well into the reign of another grandson, Rama VII. One of King Mongkut's last official duties came in 1868, when he invited Sir Harry Ord, the British Governor of Straits Settlements from Singapore, as well as a party of French astronomers and scientists, to watch the total solar eclipse, which King Mongkut himself had calculated two years earlier, would take place at (in the King's own words) "East Greenwich longitude 99 degrees 42' and latitude North 11 degrees 39'." The spot was at Wakor village in Prachuap Khiri Khan province, south of Bangkok. King Mongkut's calculations proved accurate, but during the expedition King Mongkut and Prince Chulalongkorn were infected with malaria. The king died several days later in the capital, and was succeeded by his son, who survived the malaria. For his role in introducing Western science and scientific methodology to Siam, King Mongkut is still honored in modern Thailand as the country's "Father of Modern Science and Technology." Reportedly, King Mongkut once remarked to a Christian missionary friend: "What you teach us to do is admirable, but what you teach us to believe is foolish." King Mongkut periodically hired foreign instructors to teach his sons and daughters English. Among these teachers were a missionary named Dan Beach Bradley, who is credited with introducing Western medicine to the country and printing the first non-government run newspaper, and, on the recommendation of Tan Kim Ching in Singapore, an English woman named Anna Leonowens, whose influence later became the subject of a Thai historical controversy. It is still debated how much these foreign teachers affected the world view of one of his sons, Prince Chulalongkorn, who succeeded to the throne. Anna claimed that her conversations with Prince Chulalongkorn about human freedom, and her relating to him the story of Uncle Tom's Cabin, became the inspiration for his abolition of slavery almost forty years later. It should be noted, however, that the slavery system in Siam was very different from that in the United States, where slavery was based on race. Slavery in Thailand was often voluntary and due to economic circumstances. A master could be punished for torturing slaves in Siam, and some 'slaves' could buy their freedom. Bishop Pallegoix states that slaves are 'well treated in Siam—as well as servants are in France;' and I, from what I have seen, would be inclined to go even farther, and say, better than servants are treated in England... In small families, the slaves are treated like the children of the masters; they are consulted in all matters, and each man feels that as his master is prosperous, so is he... ( 1969:193-94). Later scholars rely to a remarkable extent upon the conclusions of Jean Baptiste Pallegoix and Bowring. Bowring and Pallegoix are clearly the implied European observers behind Robert Pendleton's comment that, "The slaves were, by and large, not badly off. European observers generally reported that they were better off than freemen servants in Western society" (1962:15). Citing Pallegoix, Bruno Lasker writes that "since they were essential to the support of their owners, they enjoyed a relatively humane treatment" (1950:58). Also citing Pallegoix, Virginia Thompson writes, "Though their condition varied...their status was always comparatively easy and generally humane" (1967 : 599). Citing Pallegoix and Bowring, R. B. Cruikshank writes, "In any event, most observers suggest that slaves in Siam were very well treated." Not only have scholars argued that slaves were well-treated, but many have argued that the entry into servitude was a voluntary economic decision. Bowring cites as evidence "the fact that whenever they are emancipated, they always sell themselves again" (1969 : 193)." Leonowens' experiences teaching Mongkut’s children became the inspiration for the Rodgers and Hammerstein musical The King and I, as well as the Hollywood movies of the same title. Because of their incorrect historical references and supposedly disrespectful treatment of King Mongkut's character, these movies were for some time banned in Thailand, as the Thai government and people considered them to be lèse majesté. To correct the record, in 1948, well-known Thai intellectuals Seni and Kukrit Pramoj wrote The King of Siam Speaks. The Pramoj brothers sent their manuscript to the American politician and diplomat Abbot Low Moffat, who drew on it for his 1961 biography, Mongkut the King of Siam. Moffat donated the Pramoj manuscript to the Library of Congress in 1961. ↑ Slavery in Nineteenth Century Northern Thailand: Archival Anecdotes and Village Voices, Kyotoreviewsea.org. Retrieved February 20, 2008. ↑ Abbot Low Moffat (1901-1996) Retrieved February 20, 2008. Landon, Margaret, Margaret Ayer, and Edith Goodkind Rosenwald. 1944. Anna and the King of Siam. New York: The John Day Company. White, Stephen, and Robert A. Sobieszek. 1985. John Thomson a window to the Orient. New York: Thames and Hudson. This page was last modified on 15 October 2018, at 22:35.